There are lies that we know are lies but play along. I’ll call you. Baby, I think those jeans are just cut wrong.I knew nothing about that. You are the best, EVER. If we only made a little more money, we’d be happy. I was just checking her posture. I’d like to live a stress free life. Although many of those would be great fodder for a blog, I’d like to explore the last one. I had a client the other day who was talking to me about religion. He said that none of them made sense because heaven, paradise or nirvana is always described as peaceful and easy. That sounded like hell to him. He said that if we didn’t have something interesting and a bit challenging, we would be bored and unhappy. Okay, he IS a lawyer who specialized in intense international negotiations but still, I kinda have to agree with him. Bear with me through a graph and some explaining. The chart below is an adaptation of the original chart by Sensory Integration icon, Julia Wilbarger. 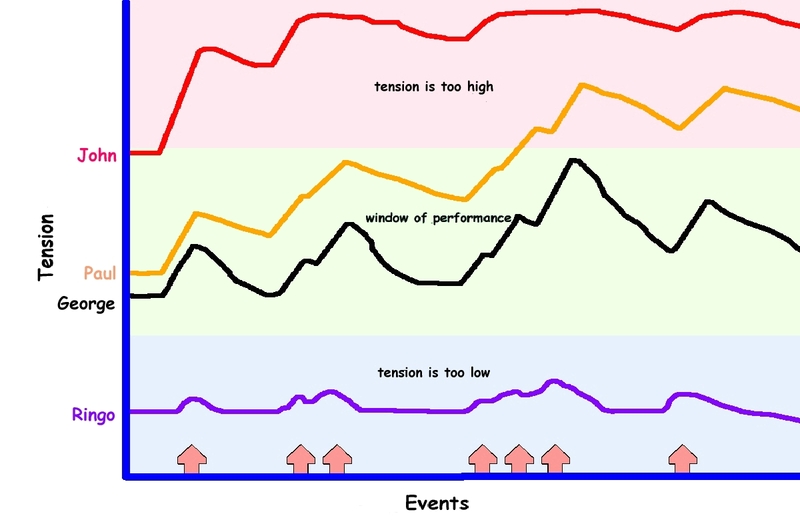 It is a simplified model of how frequency and intensity of events change our level of tension.There are events at the bottom. These events could be anything that evokes a response. A loud noise. A car pulling in front of you. The scratchy tag in your shirt. A child calling your name. A Starbucks latte. Comforting warm air. Muggy humid air. An open refrigerator. The 4 lines show how different people might respond. If tension is too high (red zone), or too low (blue zone) people get overwhelmed or bored. When this happens they become less able to attend. They drop tasks, forget things, get grouchy, shutdown and otherwise can’t respond appropriately and/or move to the next task. Notice how there is a strong relationship between the response to events, the recovery from events and the level of tension. George has the most steady rhythm in the group. He can blend in when it is exciting or when things are going slow because he gets back on track so quickly. Look how George stays in the “window of performance” because recovers better than Paul does. If Paul had faster recovery or a wider window of performance, Paul wouldn’t get out of sorts. He probably needs a complex fidget for his hands or maybe some singing and he’ll be just fine. John is stimulated by everything and probably needs a complex fidget for his hands to calm himself and lots of singing. He probably tries to control the group and calm things down. He may self medicate until he just can’t take it anymore and finds a low-key partner. Ringo needs a lot of input and is looking for intensity, like something to beat on, to help him pay attention. Ringo would do well on stimulants like Ritalin which would jack him up into the window of performance. Without Ritalin or something to beat, Ringo might create a commotion or playing class clown so that he entertains himself and slows everyone else down. There should be a movie about this. The point is that people naturally seek the right stimulation that keeps them in the window of performance. It needs to be enough tension to keep us interested in the game but not so much tension that we can’t keep up or we have a meltdown. Watch it in your lives. Watch it in the lives of others. Everyone seeks the window. Kids seek it more blatantly than adults do. When trigger points are released, several changes occur. Low muscle tone goes away as muscles are now able to contract. Hypertonicity is reduced as muscles can now stretch without pain. That’s right, trigger points give your child both hypertonicity and low muscle tone. I bet you were confused when therapist told you that your child had both. Trigger points do more. Some drive them into fight or flight. Other make them sluggish and depressed. Still others make them Sensory Defensive. I’ll write a lot more about trigger points, regulation and children in another post. Here’s a paper about trigger point concepts, if you’re a therapist looking for more details. The question is how do you eliminate lots of those trigger points in a short period with people who really don’t like a lot of touching? How can we open neurovascular pathways to sensory organs? How to we change balance and proprioception quickly and with lasting results? One answer is a good craniostructural technique that has a method for dealing with The Godfather of Organized Pain. I’ll talk more about how that works in another post too. At any rate, we all need tension to be happy and behave. That place where the good folks go must be a place were the beds are not too soft or too hard. The porridge is not too hot or too cold. The tension is just right. To readmore posts about sensory processing click here. Tony Preston has written and taught about anatomy, trigger points and cranial therapies since the mid-90s. He has treated children with sensory integration dysfunction for more than 20 years. He has a practice in Atlanta, Georgia where he sees clients.